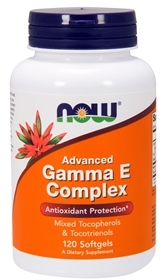 NOW Advanced Gamma E Complex provides the necessary full range of antioxidant protection because it contains a more natural balance of Tocopherols plus a full complement of Tocotrienols. NOW’s “Advanced” formula thereby provides superior support for cardiovascular health, as well as protection for the health of the prostate and the colon. Among all the vitamins, vitamin E may be the most complex because it exists in eight structurally related forms: alpha, beta, gamma and delta tocopherols; and alpha, beta, gamma and delta tocotrienols. While alpha-tocopherol receives most of the attention, new research is emerging that demonstrates the unique functions and potentially significant health benefits of gamma tocopherol, especially with regard to heart disease and cancer. Gamma tocopherol is a potent fat-soluble antioxidant. Studies have shown that gamma-tocopherol also has the unique capacity to destroy existing toxic chemicals, which damage cells and promote chronic inflammation.